The Lone Star State is replete with so many awe-inspiring natural splendors and man-made masterpieces, it’d be pretty hard to fully experience them all in one lifetime. So we’ve narrowed things down to the 30 sights that you absolutely must lay your eyes upon during your time in Texas. And unlike the Pokémon you’ve been chasing and are already bored with, these REAL-LIFE landmarks have staying power. You can find four breathtaking Spanish colonial missions -- Concepción, San José, San Juan, and Espada -- sittin’ pretty in this National Historical Park. 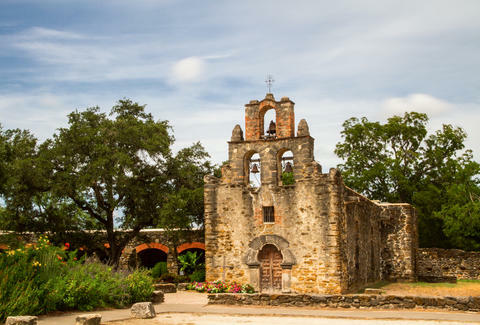 Encompassed by towering walls, the missions house historic churches and buildings dating back to the early 1700s, when missionaries used them as a palace to convert local Native Americans to Catholicism. In 2015, the park earned its designation as a UNESCO World Heritage Site, so you know it’s legit. You ain’t no Texan until you salute the Lone Star’s Capitol building. 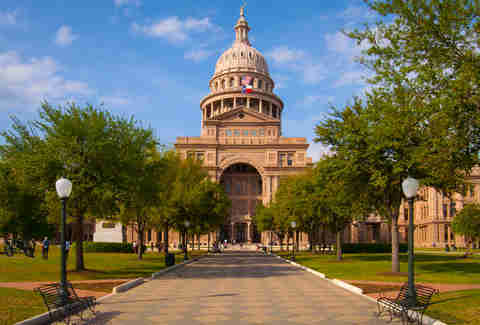 Erected in 1888 in Downtown Austin, the 308ft-tall structure stands even higher than even the United States Capitol in DC, proving everything really is bigger in Texas. Throughout the aesthetically and historically significant architectural wonder, you’ll find 392 rooms, 18 vaults, 924 windows, and 404 doors. But more importantly, you’ll find a rotunda, which basically acts as an echo chamber where you can make your 13-year-old self proud by whispering a string of dirty words. Fort Worth is dubbed “Cowtown” and “where the West begins” for good reason. Just take a stroll along the famous stockyards, a former livestock market from 1866, and you’ll see why. While you take that stroll, do so with an open container, because it’s allowed there, so it’d be sinful not to take advantage, right? You gotta give it up to the four college kids who discovered this two-mile-long cavern under a limestone bridge in 1960, mostly because all you accomplished in college was learning how to hack ramen and Funyuns into a poor man’s French onion soup. Pay your respects by visiting the natural relic. Formed by an underground river that dissolved the limestone, the 180ft below-ground passage and surrounding caves are open to explore through guided hikes. When an estimated 80,000 people a year from around the globe deem a Houston landmark worth a visit, you know something’s up. Maybe it’s because this totally zen chapel is widely considered to be one of the holiest places on the planet, even earning itself a spot on National Geographic’s “Sacred Places of a Lifetime: 500 of the World's Most Peaceful and Powerful Destinations.” Hit the bare-bones, contemplative space to feel the power. Leave it up to this rebel state to take a monumental international landmark and stick a giant red cowboy hat on it. 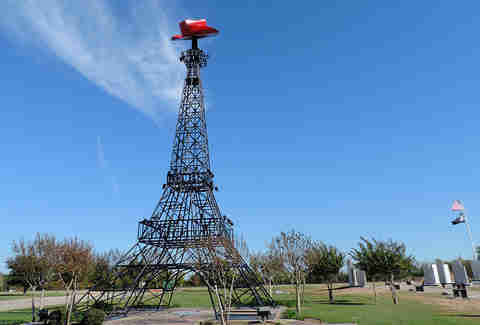 Located in Paris, Texas, and standing 65ft tall, this cheeky homage to the Eiffel Tower was built by an iron worker’s union in 1993. That same year, Paris, Tennessee built a 60ft replica, which was fine by us until they added another 10 feet on top. Not to be outdone, Texans stuck a big ol’ cowboy hat on top of the faux architecture, then laid claim to housing the "Second Largest Paris in the World." That is, until Vegas erected a 540ft tall one in 1999. Well, crap. At least theirs doesn’t have a sick hat. In collaboration with the Launch Control Center at NASA's Kennedy Space Center in Florida, NASA's Mission Control Center at the Lyndon B. Johnson Space Center in Houston is responsible for making sure whatever insane space stuff we’re doing runs smoothly. Sign up for a tour and you can see the historic mission control room, where all the Gemini, Apollo, Skylab, Apollo-Soyuz, and Space Shuttle happenings occurred. Just over 30 miles north of El Paso, you’ll stumble upon the 860-acre Hueco Tanks State Park, which was named for the “huecos” – or large natural rock basins – that encompass it. Rumor has it the place was a spiritual haven for ancient Native Americans who used the basin’s pooled water to survive in the arid land. Today, their 1,000-year-old pictographs can be found all over the monstrous boulders. Just remember what your first girlfriend taught you: you can look, just don’t touch. Because the oldest continually run dance hall in the state ain’t going to two-step all over itself. 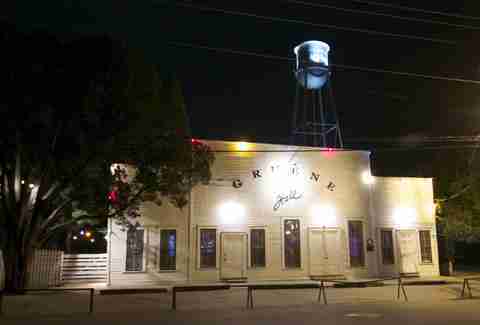 Built in 1878, the legendary dance hall has played home to country music greats like Willie Nelson, George Strait, and Lyle Lovett. This enchanting pink batholith is the second-largest granite dome in the nation. Roughly a billion years ago, a large pool of magma (that’s hot liquid rock, for all you science haters) pushed up rock lying about seven miles below the earth’s surface. Overtime, it cooled, hardened, and eroded, forming the mammoth granite structure that soars above ground today. Native tribes once believed it to be haunted, so go ahead and camp out overnight. We double-dog dare you. Don’t be fooled by the name. 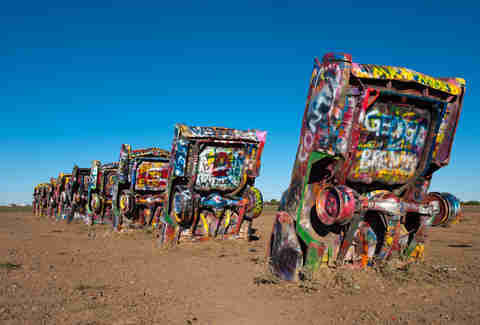 Cadillac Ranch is not a ranch at all, but rather a public art installation/roadside attraction made up of junk Cadillacs that you most definitely need to Instagram on your journey along the epic Route 66. There were a lot of battles in Texas, but perhaps none were more significant than the battle that is widely known as the decisive battle of the Texas Revolution. We’ll let you guess the name of it when you visit the historic San Jacinto Battleground. While you’re in La Porte, hop over to the Houston Ship Channel and find this flagship battleship, which took part in some of the most important naval battles of the 20th century. Commissioned by the U.S. Navy in 1914, the USS Texas is the last remaining battleship that participated in both World War I and World War II. Hidden away in Bastrop State Park is over 660 acres and 13 miles of forest thick with 18,000-year-old loblolly pine and hardwoods. It gets its moniker from one unique characteristic: it grows over 100 miles away from the genetically identical Piney Woods that cover almost 55,000sqmi of East Texas, Southern Arkansas, Western Louisiana, and Southeastern Oklahoma -- a separation that geologists believe was due to a massive prehistoric glacier. Get exploring, and be sure to spend some time at lookout points like Fehr’s Overlook. The Texas White House is the heart of the LBJ Ranch, home of President Lyndon Baines Johnson and a hub for some serious global politicking for over 20 years. Johnson was the first president to create a functioning center away from Washington, and as such, he donated the “house full of gifts that's a gift to our nation" to the National Park Service and the American people in 1972. Love ‘em or hate ‘em, the Big D’s main pigskin-tossing homies know how to draw a crowd. 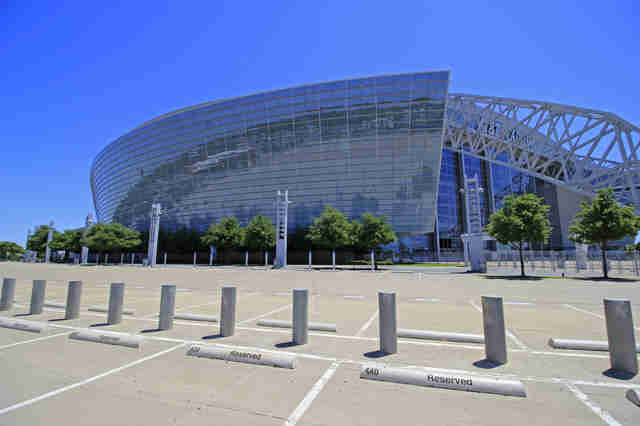 Officially known as AT&T Stadium but better known as "Jerry World," the 80,000-seat stadium cost $1.15 billion to build (with an original $650 million cost estimate, whoops!). Construction was completed in 2009, when it debuted its $40-million display board, the world’s largest (at the time) HD video screen that hangs in full glory from 23-yard line to 23-yard line. The entire vibe of Marfa is offbeat, so it’s almost expected that you’ll find super-weird things in the West Texas town. Take Prada Marfa, for instance. The minimalistic art installation was installed by artists Elmgreen and Dragset in 2005. Described by the artists as a "pop architectural land art project," the permanent artwork has been interpreted as a criticism of consumerism, but it looks more like an abandoned luxury store in the middle of a desert to us. Also known as Gresham's Castle, this ornate Victorian-style house dressed with stained-glass windows and bronze dragons is a focal point of Galveston’s Historic District. 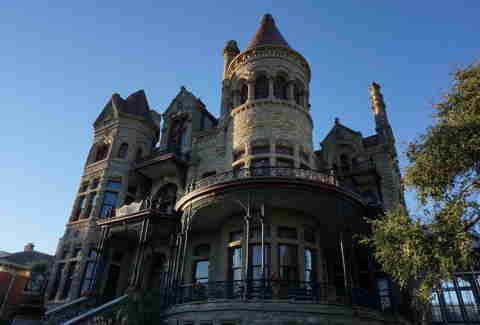 Located in the East End on Broadway and 14th, the giant stone mansion was built between 1886 and 1892. Apparently it was constructed with magic, because it was one of the few structures to survive the great hurricane of 1900. When it was built over Lady Bird Lake in 1960, no one knew the bridge would eventually house the largest urban bat colony IN THE ENTIRE WORLD. Catch anywhere between 750,000 and 1.5 million Mexican free-tailed bats spiraling out from the bridge’s crevices near dusk, with the best shows occurring April through October. Built in 1852 to guide ships through the Brazos Santiago Pass, this iconic lighthouse now acts as a beacon for hipsters trying to live-broadcast the fact that they’re watching classic films from a really cool lighthouse. Whether you’re into religion or not, Joel Osteen’s megachurch housed in a former sports arena is a sight to be seen. When Houston relocated its sports teams to the Toyota Center in 2003, the city leased the arena to Lakewood Church, which then invested $95 million in renovations to convert the arena into the absolutely massive house of worship that it is today. Around 43,500 people attend each week, making it easily the largest congregation in the United States. 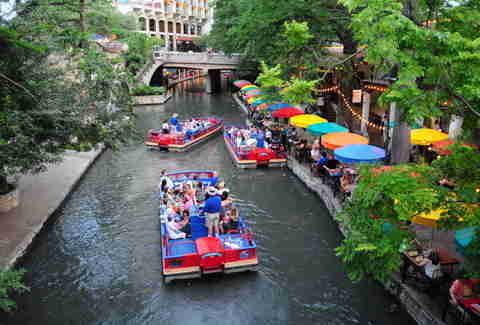 Lying a story beneath the streets of Downtown, the winding Paseo del Río is one of the most popular tourist attractions in the entire state. The bar, restaurant, and shop-lined esplanade is fun year-round, but we suggest visiting during the magical Fiesta de las Luminarias around Christmastime. This cavernous limestone swimming hole is the coolest places to seek refuge from the scorching Texas sun. Apparently locals feel the same way, as you can tell by the line to get in if you try showing up after noon. 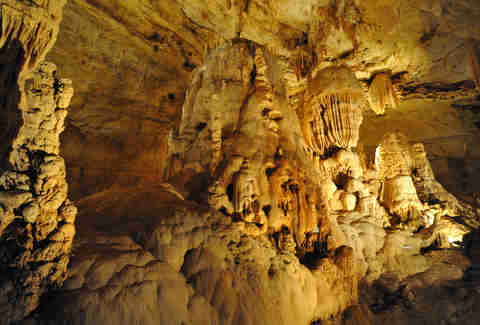 The drop-dead gorgeous natural pool and grotto was created when the dome over an underground river caved in. Did you know Texas had its own Grand Canyon? Showing off a seemingly endless array of green- and sunset-colored terra cotta over its 120-mile long, 800ft deep landscape, it’s the second-largest canyon in the United States. But the seriously underrated sunken valley is only visited by around 300,000 people per year compared to the Grand Canyon’s 5+ million, making it one of the state’s best-kept secrets. Yup, that JFK assassination site. Get your conspiracy theories ready and head to The Sixth Floor Museum, which occupies the top two floors of the former Texas School Book Depository building, from which Lee Harvey Oswald fired that rifle (allegedly). 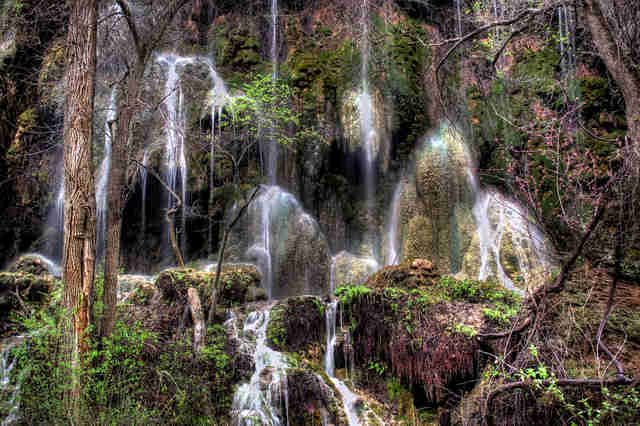 The 5,000+ acre Colorado Bend State Park isn’t without natural beauty. There’s 32 miles of sinkhole, cave, and springside trails for you to get lost on, after all. But perhaps the sickest trek you can make is the rugged hike to Gorman Falls, where you’ll be treated to the misty chill and truly awesome sight of a 60ft-high waterfall cascading into a fern-covered grotto. Spanning over 800K acres, Big Bend National Park is one of the largest national parks in the US, so there’s obviously a lot of area to cover. Start with a healing soak in a hot spring in the park’s Hot Springs Historic District, where ancient fossil water carrying dissolved mineral salts gets heated to 105 degrees by geothermal processes. A dip is said to be good for the mind, body, and soul, but you want to save that visit for the winter. With a trunk circumference of 35ft and a height soaring 44ft into the sky, not only is this more than 1,000-year-old tree one of the largest live oak trees in Texas, it’s also one of the largest in the nation. Did you seriously think we were going to not remember the Alamo? The enduring symbol of the Texans’ heroic resistance to oppression in their struggle for independence?? We’ll save the history lesson for your visit and give you a sweet ghost story instead: before the Alamo was built as a mission in the late 1700s, the site was used as a burial ground between the years 1724 and 1793. In addition to the thousands of bodies that were laid to rest there, the Battle of the Alamo brought the deaths of another 200 rebel Texans and more than a thousand Mexican soldiers, some of whom were buried while others were burned or tossed in the San Antonio River. It didn’t take long for the ghost sightings to occur, the first of which came only weeks after the battle. After winning the battle and leaving San Antonio, General Santa Anna was captured by Sam Houston. 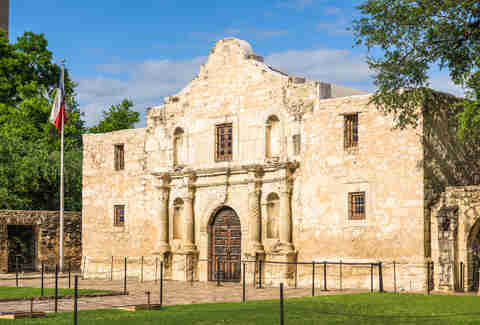 In retaliation, Anna sent messengers back to destroy the Alamo, but when they got there, they claimed to see six spirits guarding the mission door and yelling, "Do not touch the Alamo, do not touch these walls!" Fearing their lives because ghosts are creepy AF, they fled and the Alamo was left standing. Some say the ghosts were spirits of the Alamo defenders, while others say the messengers may have gotten into some rogue peyote. Either way, the Alamo lives on. Brooke Viggiano is a Houston writer who is pissed because she’s been to the Alamo but no one told her that cool ghost story while she was there. Help her avoid another calamity by sharing your cool ghost stories with her @BrookeViggiano.